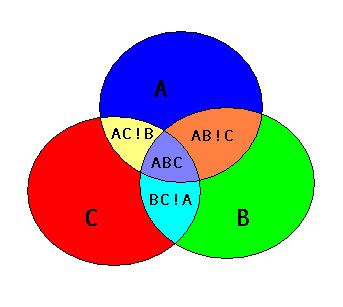 What is the proper name for the “Venn diagram” of a set of geometries? Image taken from this answer. The resulting polygons have no overlaps; each region of space is covered by only one polygon. All boundaries are preserved; every combination of intersecting input polygons results in a separate polygon in the result. This is similar to a Venn diagram in that result is all the separate relations of the polygons. What is the proper name for this operation or for the output? "Intersection" does not seem appropriate, as that might be only the region where all the inputs intersect. "Overlay" seems inappropriate, since that involves combining multiple sets of input (layers) and does not self intersect a single input layer. I'm really at a loss at what to call this thing, but I feel confident it must have a formal name. Mathematically, in terms of set theory, your output is a combination of intersections (∩), unions (∪) and differences (-). Note than the intersection and union operators have the conmutative property, but the difference operator has not. That is a particular (and useful) combination of those operators on the original sets. But I don't think that it has a formal name. ii) what is the standard terminology for it. AB intersection with attributes from polygon B. Tip: Union can run with a single input feature class or layer ... The area of overlap will always generate two identical overlapping features, one for each of the features that participates in that overlap. On the other hand, it seems there is not a standard name adopted to produce that output of a Venn diagram. Union is not consistent at least across some GIS software. For example, ST_Union from PostGIS will work like tools Dissolve or Merge from ArcGIS where there are overlapping polygons. The most close standard terminology for a GIS task I can think of to describe a Venn diagram output are the complementary tasks of Intersect and Symmetrical Difference on overlapping polygons. Not the answer you're looking for? Browse other questions tagged vector intersection union terminology symmetricdifference or ask your own question.